Tried of paying for cable or satellite TV with no ability to advertise and grow your business and sales? Turn this monthly expense into a marketing investment helps your neighborhood local business! Want to sell more to your customers when they are most likely to buy more from you? Run ads for your business alongside our YouTube “Best Of Highlights” Videos and your ads will be sure to be seen and INCREASE YOUR SALES AND PROFITS! Want to gain new customers, patients or clients with Free Advertising? Just refer other local businesses to us and we’ll give you FREE AD on their Local Video Ad Network screen to help you do just that! You can even SWAP ADS with other local businesses if you like. Choose the YouTube Channels Right for Your Business! We enable you to display the “best of highlights” programming uploaded by your favorite TV channels to their YouTube channel. We can also play videos from other sources as well. imagery – to ensure that your customer’s eyes are glued to the set – and to your ads. Whether you choose to keep the sound turned up, down, or off completely, our software plays the most recently uploaded videos from the sources of your choice in order to provide your customers with the distraction that they seek. If You Don’t Find the Answers You’re Looking For, Contact your local representative for more information. Can I Disconnect My Cable or Satellite TV? Yes, as long as it’s not the primary reason customers come to your business location, such as with a sports bar or restaurant. All Cable/Satellite TV channels have their own YouTube channel where they post their “best of highlights” and this is what we show instead of their regular programming. Showing short “best of highlights” video clips Is actually more entertaining to a diverse crowd of customers than a regular 30 minute or more TV show. How Can I Make Money Instead of Just Spending Money? You pay less to entertain and distract your customers in order to improve their satisfaction with having to wait for their service. You can sell more products or services to your best customers while they wait in your store. What better time to advertise than when your customers are in your place of business ready to spend money? There’s a long history of proof of the value and ROI related to in-store TV advertising. You can earn free ads to bring more customers into your business. 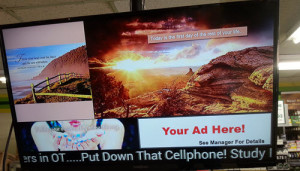 Just refer other businesses to us and we’ll play your ad on their TV for as long as they keep our service. You can earn “passive income” from your TV as well. Sell ads to other businesses who want to advertise in your business (all those business card droppers for instance…) or your vendors and suppliers who benefit every time you make a sale and you can make money just for showing their ad on your TV. If you or your staff manages this business, you keep 100% of this new found revenue. Don’t have time to focus on this? Just contract with us to sell your ads and earn a reduced share of the revenue.Just contact our friendly customer service staff to learn more. How Do I Purchase Your Service? Lease of a Stage One Media Player ($25/Month) plus installation of ($100 One Time Fee). Choose which zone you wish to advertise in and check the box beside it. Then if you need an advertisement created for you simply check the box beside the Ad Creative for that zone. Proceed to pay via credit card and we will get rolling right away. As soon as your order is completed, our service center will configure your equipment and ship it to you. Everything’s included that you’ll need. Simply open it up, connect the box to power, connect the box to your TV, turn it on and follow simple, step-by-step instructions to start it up. Contact your local representative for more information. We take all major credit cards through our secure online transaction system. You are billed once for the “Media TV box” at time of purchase, plus shipping and handling. You are also billed for your first month’s service in advance, then again every 30 days, unless you cancel. You may cancel at any time as there is no contract. If you decide to upgrade at a later date, just contact your local representative. Our warranty on the “Media TV Box” is 6 months. If anything happens, just Contact your local representative for more information. What TV Channels Will Play in Your Video Zone 1? We don’t actually show regular cable or satellite TV channels. We show the most recently uploaded videos to your selected YouTube Channels. The videos uploaded to YouTube are basically the “best of highlights” from each TV channels program day. And as they are uploaded to their channel, our software detects that and shows them on your TV. When you order, your box’s default setup includes CNN and ESPN News. However, you can select from a variety of other YouTube TV channels, or even request a new one. And here’s the best part – you can even show your own videos from your business’ YouTube channel (requires an upgrade to the Promoter Package! Now you can get those YouTube videos you created for your business that hardly anyone is watching and put them right in your own waiting room for your customers to enjoy – and sell more products or services in the process. How Do I Get My Ads to Play on My TV? Each package will help you to entertain and inform your customers, patients or clients while they wait. Each package comes with a Media TV box that easily attaches to a HDMI-ready Digital TV in just a few minutes. Our friendly and knowledgeable staff will help you choose the right YouTube channels and service package for your business. There are no contracts. Cancel any time.